These wings are fantastic for a picnic as well as finger food for a party. Put the oil, honey, soy sauce, chilli and grated ginger in a bowl and mix together. Add the chicken wings and mix them thoroughly until all of the wings are coated with the sticky glazed mixture. If time allows, leave the wings to marinade overnight, but if not a couple of hours will suffice. Pour the chicken wings and marinade into a roasting tray and add the chicken stock, cover with foil and bake for 20–25 minutes until the wings are almost fully cooked. Take the chicken wings from the oven and remove the foil. 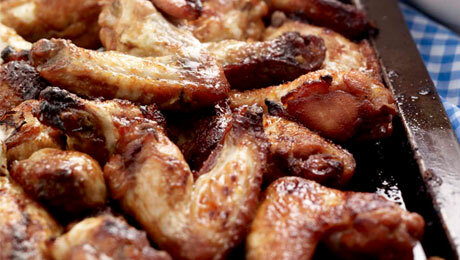 Increase the oven temperature to 200°C/400°F/Gas Mark 6 return the chicken wings and cook uncovered for 15–20 minutes. Take them out of the oven every so often and give them a little shake to prevent them from sticking to the tray but also to ensure that each of the wings are covered with the sticky glaze. Place all the ingredients into a food processor and pulse to combine all the ingredients. If necessary add a tablespoon or two of warmed water to make a smoother dipping sauce.